It was interesting to see that this record was suddenly for sale via the mighty Swami records as I had picked up a version of it as an import from Germany quite a few years ago. Though I realize it never came out in the US, I was still somewhat surprised it was been reissued all these years later. Let me assure you this is a pretty essential pick up even if you have the other version. For starters there's 2 extra songs. Don't get me wrong, they're both pretty great and I'm happy to have them on this album, but the real highlight of this reissue is that it has been remixed, remastered and re-whatever else it is they did to make this album sound so much better than the original version. It sounds so much fuller and the guitars are significantly sharper and more caustic than ever before. The bass and drumming is much meatier than the prior version and while I won't quite say it sounds like a whole new record, the difference in fidelity between the two versions is pretty remarkable. 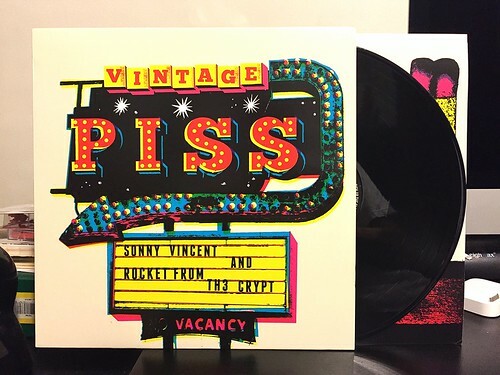 The songs themselves are the kind of no nonsense punk rock that Sonny Vincent has been cranking out since his time with the Testors. Short, sweet and deceptively catchy. There's a lot to love on this album, but for me, the highlight is "It's Not Your Fault." It could easily be a lost Sultans song with its sing along chorus and stop/start guitar riff. If you don't already have this, it's worth picking up. If you already have the original German version, it's still worth picking up. Until I actually listened to this record I though I was just buying another variant to keep my Rocket From The Crypt collection complete. Turns out I needed this more than I knew.